Relax cruising over the water, away from all the stress. Big jumps, floating in the air, kite-loops and handle passes. 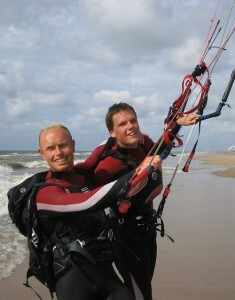 It is all possible with kitesurfing. You can take it easy and you can make it as crazy as you want. It always looks so easy to do. Still there are a few borders to cross. It is important you learn the right basics so that one day soon you will be able to go kite-surfing on your own. At kitesurfing school “kite-zone”, personal training is fundamental in the lessons. During the courses we will train you until you are ready for the sport. Apart from that we are always there to help you out with information, new gear, tips and tricks and to get you on the water. Basics with a trainer kite. Set up of the inflatable kite. You will learn to control the kite fairly quickly. If you get control of that we’re going to go for the power-zone. In the first lesson we’re mainly working with the kite. You will have to be able to steer the kite without too much thinking and control the power. We always try to get to the first stage with the board. When you are coming for the next lessons you can build up a kite straight away and we will go from where you ended up in your last lesson. Training with the board becomes the main part. If we see that this might be your last lesson we will prepare you to train on your own. We tell you what to be aware of, rules on the water and safety. After the courses it might be quite a big step to go on by yourself. You can come and train with us! There will always be someone to help you out. Refresh some theory, get some extra information or check your new gear. Or you’re always welcome to share your first jump.